It goes without saying that technology is an essential part of doing business. In today’s world, it would be virtually impossible to find a business that doesn’t rely on computers in some way. For most companies, almost every way in which they do business is reliant upon computers and technology. Of course, where there’s reward, there’s risk. Companies are currently enjoying increased efficiency and access to cloud-based tools that are revolutionizing the corporate world. On the other hand, this increased access to endless information also opens them up to an array of viruses and other potential vulnerabilities lurking on the web. In reality, one click on an unknown link can expose a company’s technological infrastructure to unbelievable damage, leaving valuable private data susceptible to an attack. We’ve all seen the problems data breaches have caused major companies in recent months, but it’s important to understand that it’s not just major corporations that face the risk of infiltration as far as technology is concerned; every business, no matter how small or large can be a potential victim to unsavory thieves. The key to avoiding outside invaders and internal accidental clicks is two-fold: you need to establish internal policies that prohibit the clicking of unknown links while educating employees about the dangers that lurk beyond those buttons, and you need to have your network managed remotely by a team of experts who will proactively go to work for you, ensuring proper barriers are in place 24 hours a day, seven days a week. 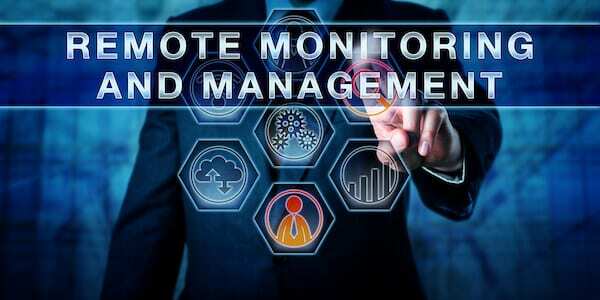 Not too long ago, businesses employed in-house IT teams to monitor, manage, and troubleshoot their networks. At the time, networks were far simpler, and the potential threats from outside sources came at a minimum. In recent years, it’s become increasingly popular for companies to hire outside firms to manage their IT systems, as networks—and threats— have grown increasingly complex. The people who used to be in-house experts have branched out to create their own specific (and necessary) niche in this ever-changing world. In the early days of IT management, maintenance meant fixing something after it broke. Obviously, if something was broken beyond repair, the information previously stored on the servers was lost forever, causing significant—if not irreparable—damage to the bottom line. Today’s managed IT focus is all about prevention. It’s no longer about finding ways to fix problems before they occur; managed IT service providers are constantly seeking potential threats and finding solutions to protect networks long before they infiltrate networks’ systems. When problems do occur, it seems they inevitably happen overnight or when the in-house IT guy is on vacation. Beyond this, in-house IT teams have limited exposure to problems plaguing the information technology era. Data backup & disaster recovery that’s wholly managed by a company that’s solely interested in ensuring its clients’ day-to-day operations continue uninterrupted. What Makes Atlantic Business Systems’ Managed IT Systems Different from the Rest? Unlike other companies, we offer our services as part of a fixed monthly fee, allowing you to easily anticipate budgetary needs without worrying about a sudden spike in costs if something goes wrong. This fee structure also means it behooves us to keep things running like clockwork, rather than scrambling around when a problem appears. To make sure you’re as protected as possible, we have strict minimum requirements for our clients. You must have our recommended managed firewall, as well as our backup and disaster recovery system (BDR) with current licensing. We then manage your patching, anti-virus, malware, and password protocols. Our managed IT services protect your business with regular backups. In the event an employee does click a malicious link that corrupts your live data, we can easily give you a clean copy so you can keep working. It’s never too early to start protecting your network, but it can certainly become too late before you even know what hits you. If you’re ready to wrap your network in a barrier of protection managed by IT experts, call our Atlantic Business Systems team at (321) 259-7575 to learn more about our Managed IT Services.